An interesting horror movie that is more thriller then gore, and more story than scares. 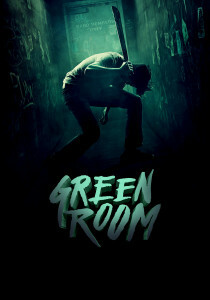 Green Room is a cool movie that very much wants to be something different. It wants to be different from other horror films, and that means little to no back story, a band of rebels and misfits who we don’t necessarily like, and death scenes that are over in a flash. These qualities all hinder the film. But what works is its storyline and terrifying situation. Patrick Stewart as the villain is pretty great too. It’s a good movie because of how unique it is, but it sure could have used some more memorable moments. Green Room isn’t your typical horror movie. In fact, it kind of prides itself on that. It lives and dies by being different, and that means it works to make this movie entertaining, but also leads to some major criticism in areas that could have been better. Specifically the death scenes of major characters. The movie is about a punk band that is playing some gigs down south. First they do an indie, grungy podcast, from the living room of the guy interviewing them. Then thry go play a show, where the payout is extremely small. They’re angry and feel like they performed for free. These guys are rebels who try to challenge society in whatever ways they can. They don’t put their music on ITunes and have no social media presence whatsoever. They feel like true fans will come and find them and seek them out. These guys also refuse to pay for gas, as they drive around the south, sneaking around parked cars in the mornings and siphoning it (stealing it,) from other vehicles. All of this helps to give us a little bit of knowledge about the group before their real story begins. I like the idea of starting out with scenes that introduce them, but how about a little bit of back story? How about we hear a little of how this group came together and how they all know each other? No such luck. This movie wants to be different, and it turns out it’s not really that hard to be that way. Just don’t give us the usual things that help flesh out a story. And that brings them to a dark, angry club in the middle of nowhere. Pat (Anton Yelchin,) and Sam (Alia Shawkat,) are front and center in the group. They are the notable stars of the film. At least for the band. This band has two other members, both guys. There’s Reece and Tiger. Reece is the tough guy. Tiger’s not. Pat is the cool headed leader. And Sam is the chick. That’s the group. At the club, they start out with an angry crowd (that they provoke with an anti Nazi song, despite a feeling that a lot of these guys are skinheads,) but then eventually win the crowd over. Everything seems to be going fine until Sam realizes she left her phone in the green room (the room a performer waits in before going on stage,) and Pat goes back to get it. They have just come off stage, and they were in the green room before they went on, so it’s been a while now. When Pat goes in, there is a dead body of a woman on the floor and some men standing over her. There is a knife stuck in the woman’s head. Pat runs out of the room and into the hallway. He joins his friends and calls the cops, but the people who work at the club approach from one side and the guys who were in the green room from the other, and soon the whole band is being held in the green room until the club owner can figure out what to do. That club owner is Darcy, played by Sir Patrick Stewart, and he’s the meanest of the bunch. Darcy orders a fake stabbing that looks like just a small bar fight to be the cover story when the police show up, (since Pat did call them.) The police take the guys involved in this fake fight away, and now it’s just the club employees and the kids. Our protagonists do have a gun, and an attempt is made to try and trade the gun for a phone. It goes horribly wrong as Pat, making the handoff through the open door, neatly gets his hand hacked off. The rest of the movie is about the club workers killing the band members one by one. And this would be fine, if some of the deaths were shown for more than a quick flash. But this movie takes the position that death is not art. It is not cinematic. It is brutal and quick and does come out of nowhere. So characters are instantly shot, or attacked by dogs or stabbed. Sometimes it happens so fast that we second guess it. Is this main character really dead? Just like that? This movie works because of its premise, and it’s scares, but there isn’t a whole lot that stands out as very memorable. And that’s kind of the point. They don’t want us to remember death scenes as individual moments. We are used to seeing these things, and a better movie would have known or cared that they are kind of a necessary. Green Room has s different agenda. Patrick Stewart is a pretty menacing villain, and if there’s a takeaway from this movie, it’s probably that. I admire Grren Room for trying to be different, but throwing the audience a few bones every now and again would have helped a little too.